So, you’re sitting at your desk thinking about the sci-fi movie you watched last night or a fantasy outerspace adventure. If you can’t wait for the weekend to make your futuristic dreams a reality (sort-of), start by building an Office Supplies Starship Enterprise. From your employer’s supply cabinet, grab one wall clip, two small paperclips, one large paperclip, one small pinch clip, some tape, and a black Sharpie. With a little ingenuity, you have a passable replica for some afternoon day-dreaming. Now, for tomorrow’s task – build a cardboard spaceship out of two washer/dryer boxes. With a little paint it sure can look good — too bad it can’t fly. The construction worker spends his free time inside a rented storage garage in Clinton Township, Mich., where he broods over a 14-foot-wide, carbon fiber, fiberglass vessel. Thirty years ago, when Carrington was 27 and obsessed with science fiction, he set out to build a UFO look-alike. Despite his lack of engineering experience, Carrington pored over books, magazines and studies about aviation and spent nearly $60,000 for some of the materials needed for this saucer. Carrington does it because he believes he has discovered a simple design for an aircraft that aeronautical engineers have spent countless millions trying to build. Carrington has two patents on the design and a company called Vertex Aerospace. His work caught the attention of NASA, which invited him to a conference in the mid-1990s where engineers scratched their heads when he confessed he knew nothing about computers. His own version of Anti Gravity Technology Propulsion: His idea is to fire up the vessel with a rotary engine to stimulate a magnetic levitation system to rotate the ship’s two discs. The discs would draw air into propeller blades. Orbital Sciences Corporation (NYSE: ORB), a world leader in smaller-sized civil government and national security satellites, announced today that it has been selected by the Defense Advanced Research Projects Agency (DARPA), Arlington, VA, to develop a Phase 1 concept for System F6 (Future Fast, Flexible, Fractionated, Free-Flying Spacecraft united by Information eXchange). DARPA is the central research and development organization for the Department of Defense (DoD). They could only come up with six "F’s"? Come on. We note that the everlarger monolithic spacecraft of today are notoriously unresponsive. We then suggest a novel architectural paradigm, which we call fractionated spacecraft, whereby a satellite is decomposed into a set of similar or dissimilar component modules which interact wirelessly while in cluster orbits. 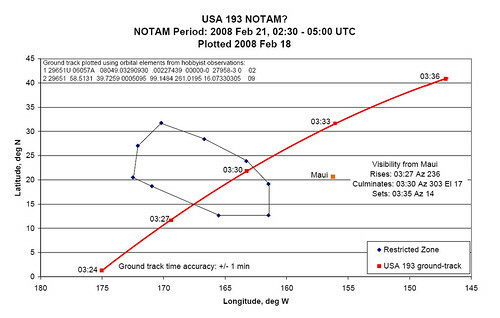 According to DARPA such a virtual satellite effectively constitutes a "bus in the sky" – wherein customers need only provide and deploy a payload module suited to their immediate mission need, with the supporting features supplied by a global network of infrastructure modules already resident on-orbit and at critical ground locations. In addition, there can be sharing of resources between various "spacecraft" that are within sufficient range for communication.DARPA said the within the F6 network all subsystems and payloads can be treated like a uniquely addressable computing peripheral or network device. "The agreement with Northrop Grumman will allow SS/L to cost-effectively add capacity to address increased near-term commercial satellite opportunities," said Pat DeWitt, chief executive officer, Space Systems/Loral. "The agreement will also streamline the process for our companies to collaborate on providing the world’s best satellites for both civil and defense applications." "The resulting strategic agreement will be important to increasing our competitiveness. These initiatives will present win-win opportunities for both companies and our U.S. government customers," said Alexis Livanos, corporate vice president and president of the company’s Space Technology sector. "For some of our mission areas, we believe that assured access to SS/L’s 1300 bus and bus subsystems would improve our cost and delivery schedule competitiveness. In addition, hosted payloads hold the promise of providing us greater ability and flexibility to rapidly respond to our government customers’ evolving needs." 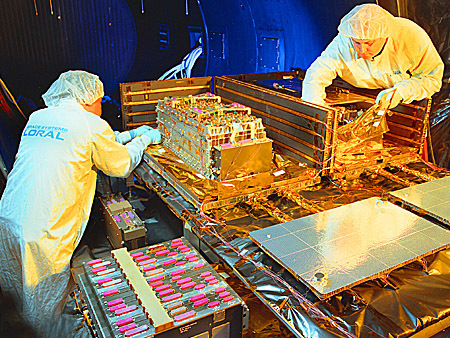 Some of these new opportunities included "hosted payloads" where specialized instruments or entire subsystems can be added on to a satellite bus whose primary mission is paying most of the build cost. Given the importance of the role space plays in today’s C4ISR systems (Command, Control, Communications, Computers, Intelligence, Surveillance and Reconnaissance), and the expected ends-of-life of the spacecraft currently in orbit, we’ll need a bunch of new launches in the short term. Factor in programs being behind schedule — with some going way over budget — and you might conclude we have a problem, Houston. Intelsat General is going after this market, too. HBO today seems like an old familiar standby, but the channel has a strong history of being the first to adopt new technologies to expand its audience reach. On September 30, 1975, HBO, affectionately known colloquially as "Home Box", became the first TV network to continuously deliver signals via satellite when it showed the "Thrilla in Manila" boxing match between Muhammad Ali and Joe Frazier. On December 28, 1981, HBO expanded its programming schedule to 24 hours a day, seven days per week. (Cinemax was 24/7 from the day it signed on, and Showtime and The Movie Channel went 24 hours earlier.) In January 1986, HBO also became the first satellite network to encrypt its signal from unauthorized viewing by way of the Videocipher II System and in 1993 became the world’s first digitally transmitted television service. In 1999 HBO became the first national cable TV network to broadcast a high-definition version of its channel. Fast forward 33 years, and its no surprise to see HBO is among the first networks to start its own channel on YouTube. We’ve seen in the presidential race the incredible reach that YouTube has when quality, entertaining content is made available to users. The pro-Obama music video Yes We Can, for example, has reached more than twice the viewers of the last presidential debate. Al Gore’s Current TV channel, of course, has been at this nexus between the internet and television for several years, and has embraced its ancillary of user generated content. UGA is likely to further transform the media landscape, especially as the promise of IPTV opens up the possibility of millions of channels — and each of those channels will need to be fed fresh content. Until then, you can watch the Sopranos at work, which we think is a good thing. Scoring at the Satellite show in Washington? Maybe at Sunday’s hockey game (the New Jersey Devils beat the Washington Capitals in overtime). While formally beginning tomorrow, today’s "preday" schedule at the Satellite 2008 conference in DC is chock full of panels and presentations. As the conference website says, Satellite 2008 is "where the most prominent experts, C-Level executives and thought leaders" in the satellite industry "join forces for YOU." Hughes Network Systems "will showcase the power of broadband services as it highlights its advanced fixed and mobile satellite offerings…Visitors to the booth can experience these services first-hand through interactive demos. From digital signage, to distance learning, to emergency communications and continuity of operations, Hughes is leading the way in bringing broadband to governments, enterprises, small businesses and consumers. Hughes executives will be presenting on several panels throughout the conference, addressing topics ranging from government solutions and hybrid networks, to Ka-Band opportunities and top satellite markets of the next half-decade." iDirect, which recently tested the commercial version of its DVB-S2 Evolution platform simulating a live customer environment, will have a booth where users can try out the platform’s VoIP, Web browsing and other capabilities. iDirect’s Evolution platform comprises a new line of DVB-S2 remotes and line cards as well as advanced operating and network management software, according to their press release. "During the tests, the platform’s Adaptive Coding and Modulation (ACM) feature successfully enabled iDirect’s Evolution series remote to maintain optimum coding and modulation schemes, operating at 16-APSK during fair weather conditions and shifting to more robust modulation and coding schemes during a simulation of link fade conditions." MorganFranklin and GATR Technologies will be at booth #1600. "GATR will display its transportable, inflatable, high-bandwidth satellite antenna system (GATR-Com). Its unique inflatable design allows it to be carried into locations where a high-bandwidth (large aperture) dish is required and a satellite truck or trailer cannot be deployed. MorganFranklin will provide the reliable communication infrastructure (satellite, RF and IP network integration) that completes the connections (IP-based phone, Internet, broadcast video/audio and/or data) as needed for challenging communication situations such as mobile emergency communications, remote news gathering and broadcasting, and military applications." Newtec, a world-leading innovator in the satellite and communications industry, will be displaying ‘Point&Play’, "an innovative capability involving an antenna pointing tool, combined with advanced satellite modem software, which allows the installer, be it a professional installer or the end user, to easily position the antenna correctly. It does not require any computer pointing software, provides correct satellite identification and gives feedback on both signal quality and correct satellite lock." Undoubtedly, there will be other displays of interest at Satellite 2008. What are you seeing that fires your imagination? Personal navigation devices are a hot gift to give this holiday season. Unit sales of GPS systems rose 488% over last year, according to the latest point-of-sale information from market research firm NPD Group. GPS chipset provider, SiRF Technology Holdings is the company to beat in the personal navigation device space, with over 50% market share. The company is one of several gearing to battle it out for a piece of the next-generation cellular handset market. Mobile phones are only starting to emerge as a high-growth market for GPS chipsets, which include the basic radio-frequency (RF) and GPS base-band chips. True, most handsets already incorporate the technology, but it goes largely unused because most network operators have been slow to roll out location-based services with broad consumer appeal. The other reason GPS chipset suppliers have ignored the current generation of mobile handsets is Qualcomm, which has been packaging GPS capability into its mobile phone chips for the last seven years. The industry, however, is shifting from today’s global system for mobile communications and CDMA network standards toward 3G, or W-CDMA standards, and next generation-compatible handsets are forecast to see a compound annual growth rate of 22% over the next five years. DIY GPS tracking with "disposable" phones – Mod a GPS enabled Nextel and fauxjack yourself…or your car, or your kid, or a big dog, or an elephant. We really, really want to track an elephant. Mologogo is a free service that will track a "friends" GPS enabled cell phone from another phone(gps not required) or on the web. It currently works on pretty much any Nextel phone with Java and GPS – even a $60 no-contract Boost Mobile phone. Using any GPS-enabled phone with java and a supported provider (Nextel, Sprint, or Boost), you can install a free service called Mologogo and turn your phone into a tracking device. From your phone or the web, Mologogo shows you where you and your friends are at any moment. If you are on the go, Mologogo can alert you when friends are close, search around for points of interest, and keep you updated with local traffic and weather. Mologogo even supports mobile chat, so you can reach out to your nearby friends instantly. If you are on your PC, you can see all of your friends – locations, sign up new friends, bookmark locations, and show your Mologogo location on your own web page or blog. If you don’t have a Mologogo-capable phone, you can buy one for $80 bucks, maybe less. And, unlike some stand-alone commercial tracking solutions, the service is free (as long as your cell-phone has a data plan). As for the phones: The reason you get GPS lock so quickly (which might make you think it’s fake) is that the tower gives the phone a breath-of-life packet, containing the current satellite almanac and possibly even the position of the PRN sequences, so the GPS chip can achieve lock almost instantly. You can test this by taking the phone to an area with no Nextel towers (Montana and Mississippi work well) and telling it to acquire a GPS fix. It’ll take much longer (30-50 seconds typically), just like your Garmin, because it’s not getting help from a tower. But even in the complete absence of towers and service, the phone’s GPS chip does work just fine, and will happily feed NMEA 0183 data over the serial cable for your laptop’s mapping software. In a big boost to Virginia’s aeronautical and space industries (and economy), NASA has awarded a contract to Northern Virginia’s Orbital Sciences Corporation to resupply the International Space Station. The federal space agency on Tuesday said it will provide Orbital Sciences Corp. as much as $170 million to demonstrate its capability to resupply the space station. Orbital officials say they plan to team with NASA’s Wallops Flight Facility and the state’s Mid-Atlantic Regional Spaceport to demonstrate a new launch rocket in late 2010. If they succeed, the Eastern Shore could become a key outpost for commercial space operations, bringing jobs and investment to the region. "This is a real opportunity to see that happen," said Billie Reed, executive director of the Virginia Commercial Spaceflight Authority and head of the spaceport, known as MARS. "This is significant." Since December 2006, the fledging spaceport has hosted two successful launches into low-Earth orbit for Pentagon customers, and both featured a Minotaur I rocket developed by Orbital. To handle cargo missions to the space station, Orbital is developing a much bigger rocket, called the Taurus II. It would be the largest rocket ever launched from Wallops, said Barry Beneski, an Orbital spokesman. Because of that, the launch facilities at MARS would have to be upgraded to accommodate the larger vehicle. If those improvements aren’t made, Orbital would have to look elsewhere, probably in Florida, for a launch site, Beneski said. "We’re supporters of Wallops, and we’re supporters of developing the space industry in Virginia," Beneski said, "but infrastructure development is really the key." Reed said state leaders plan to meet with Orbital executives this week to discuss the needs. "It’s not a show-stopper," he said, adding that the spaceflight authority is empowered to issue bonds to finance improvements. "We can find ways to do this." NASA Wallops provides mission control and logistics support to MARS. The Eastern Shore launch site is considered ideal. Its latitude is aligned to the space station’s orbit, reducing fuel expenses, and rockets quickly travel over the ocean, limiting risks to populated areas. "This shows the industry that what we have to offer here is real," said Keith Koehler, spokesman for the flight facility. "We’re excited." Besides NASA’s investment, Orbital plans to pitch in $150 million of company money to the effort, known as COTS, for commercial orbital transportation services. 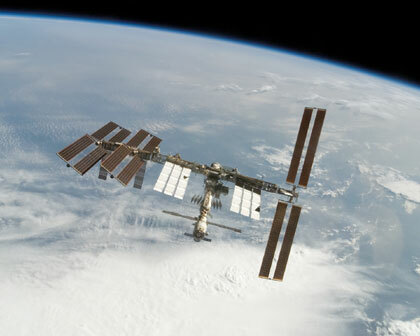 NASA’s aim is to contract with private aerospace companies to resupply the station after the agency retires the space shuttle program in 2010. Orbital is still flying high after the announcement. Shares are up more than 50 cents and profit is expected to rise by as much as 25 percent. A lunar eclipse bailed Christopher Columbus out of a jam in Jamaica in 1504. Stranded there, ships damaged on a follow-up voyage to what would be called the Americas, Columbus and crew were starving because the natives refused to trade food for trinkets. The wily explorer consulted an almanac and learned a lunar eclipse would occur on Feb. 29, 1504. On that day, Columbus told the natives that God frowned on their lack of hospitality and would remove the moon from the sky if they didn’t cooperate. The eclipse made good on the warning. The spooked natives promptly offered food if Columbus would bring back the moon, which natural events did for him. Well-supplied, Columbus and crew ultimately made it back to Europe. This eclipse comes with a rare bonus. The planet Saturn (magnitude +0.2) and the bright bluish star, Regulus (magnitude +1.4) will form a broad triangle with the moon’s ruddy disk….this upcoming double event will be the only one of its kind occurring within the next millennium! The European Space Agency and NASA both have viewing information, as well. 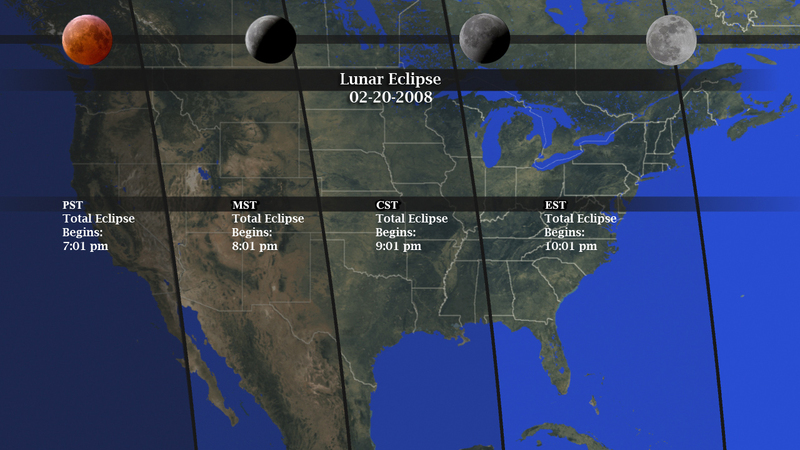 For those in North America, this map tells you the time the eclipse will begin in your location. The short of it: 10:01 pm Eastern. During an eclipse the moon changes color, going from a light gray color to an orange or deep red shade. This is totality. The moon takes on this new color because indirect sunlight is still able to pass through the Earth’s atmosphere and cast a glow on the moon. The exact color that the moon appears depends on the amount of dust and clouds in the atmosphere. If there are extra particles in the atmosphere, from say a recent volcanic eruption, the moon will appear a darker shade of red. I can’t think of any recent volcanic eruptions, do dark red may not be in the picture. 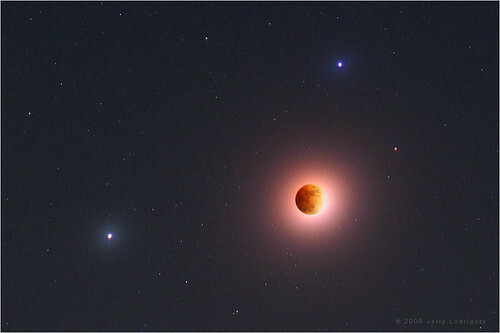 The next lunar eclipse will be on Dec. 21, 2010.